The Quill är tillbaka med originaluppsättningen! Starkare än någonsin! Keeping a band together is no easy task, keeping a band together for 25 years is damn near impossible. So how come the guys in THE QUILL manage to still be together creating music after all these years? Thru highs and lows, ups and downs the one thing that have kept the band moving forward is their love of creating music together. 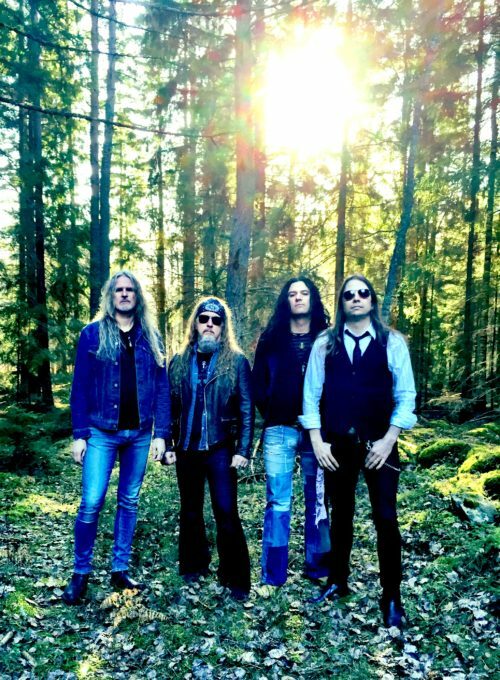 With the latest release “Born From Fire” (2017) – the original four – Magnus Ekwall vocals (Ayreon), Christian Carlsson guitar (Circus Prütz), Roger Nilsson bass (Spiritual Beggars, Arch Enemy, Firebird) and Jolle Atlagic (Hanoi Rocks, Electric Boys, Firebird) got back together again for the first time in 12 years. One of the pioneering bands in the Swedish stoner rock movement in the mid-90’s the band had a unique sound, much thanks to Magnus Ekwall powerhouse vocals, making them somewhat of an outcast in the scene. The two first albums, The Quill (1995) and Silver Haze (1999), were released on small independent labels but pretty soon the band started to gain attraction from bigger labels. This led to the band signing with SPV/Steamhammer in 2001 and while there releasing three albums. Voodoo Caravan (2002), Hooray! It’s a deathrip (2003) and In Triumph (2005). Call it midlife crises, touring fatigue och just “time to try something different” bass player Roger Nilsson left the band in 2005 and vocalist Magnus Ekwall two years later. Wasting no time Christian and Jolle continued the band with new members and signed a deal with Metalville releasing Full Circle (2011). A year later bass player Roger returned for the Tiger Blood album (2012) and in 2016 it was time for vocalist Magnus Ekwall to get back onboard. Their first album together in 14 years Born From Fire were released to huge critical acclaim and entered the national Swedish vinyl charts at # 8. Now back together again it’s clear – THE QUILL are in it for the long run! © Brädholmen Event. Webb producerad av Agent Design.